Metal Clay Test, safe to fire. 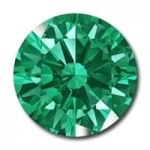 This is a man made material that is the color of Colombian emerald. Nano gemstones is a glass-ceramic material with nano size spinel crystals. High thermal shock resistance make it ideal for wax-casting and metal clay.